Apple Dumpling is an exclusive we designed as an anniversary edition for “Apple Pie House” in the UK. Graeme allowed us to extend the edition to 15 pieces to allow us 5 pieces available for our North American Collectors. 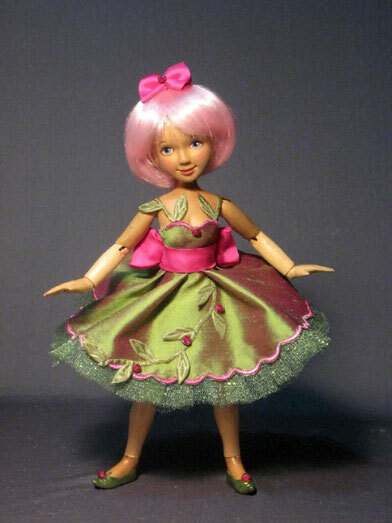 These are available through “Toni’s Collectibles” Apple Dumpling is 8” tall, 13 moveable joints, hand painted face, bright punky pink hair and a lovely bright green dress accessorized with tiny roses and pink silk sash and bow. Her shoes have been hand painted with a metallic paint in irredicent green embellished with a rose on the toe.